convert CO2 emissions into usable products. 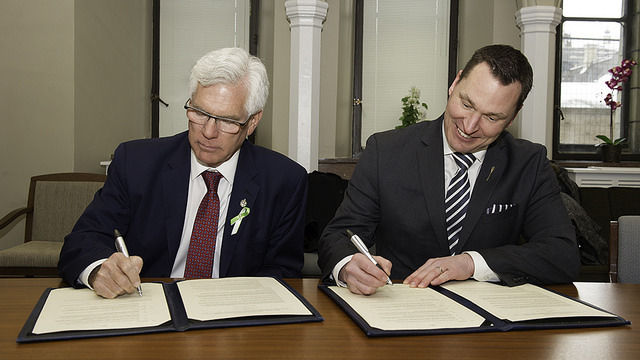 Minister Carr and Minister Bilous sign a memorandum of understanding between Natural Resources Canada and the Government of Alberta on February 13, 2017 in Ottawa. Matched provincial and federal government funding for the Alberta Carbon Conversion Technology Centre (ACCTC) will support the development of a facility to test breakthrough technologies that convert CO2 from harmful emissions into applications for everyday use. Both levels of government are contributing $10 million. The ACCTC will be owned and operated by InnoTech Alberta, a subsidiary of Alberta Innovates, and constructed at the Shepard Energy Centre in Calgary. It will initially be used by finalists of the NRG COSIA Carbon XPRIZE – a global competition offering $20 million in prize funding to innovators who can develop technologies to maximize the value of CO2. The ACCTC will support Alberta-based technology developers, as well as attracting global companies and world-class researchers to the province. The centre will also provide services to Emissions Reductions Alberta’s $35-million Grand Challenge winners – another global effort to support the commercialization of CO2 utilization technologies. The ACCTC will be available to participating companies to develop and test their technologies. Demonstrating their commitment to finding ways to maximize the value of Alberta’s resources, protect the environment and diversify the economy while cutting costs, Minister Carr and Minister Bilous met in Ottawa on Feb. 13 to renew and expand the Alberta – Canada Collaboratory on Clean Energy Research and Technology MOU. The agreement now includes a commitment to work together on clean technologies, and working with the private sector to find ways to develop cleaner oil sands development through research and innovation.